Thursday night was for the RI Stitches Meetup group at the Providence Place Borders Bookstore Cafe. There were ten other folks besides myself, all zealously passionate about our knitting. 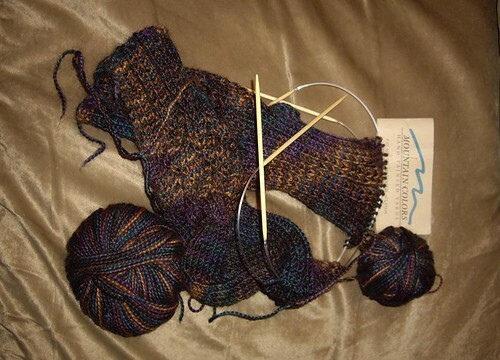 I had both sock projects to work on. We had a fun little stash exchange in Yankee-swap style. I brought a white ribbon shawl kit along with a wound cake each of a butter-colored Malabrigo and a powder-blue EL Angora/Wool. 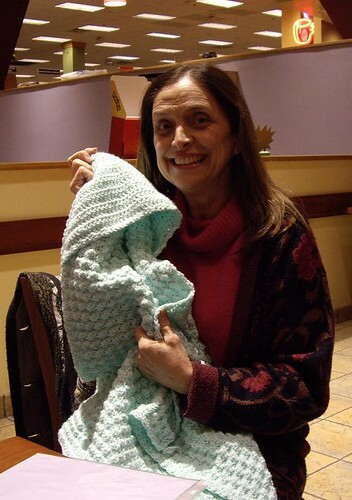 I have decided that whatever yarn I would get, I would use toward Sonya and Kevin’s Blanket of Hope. 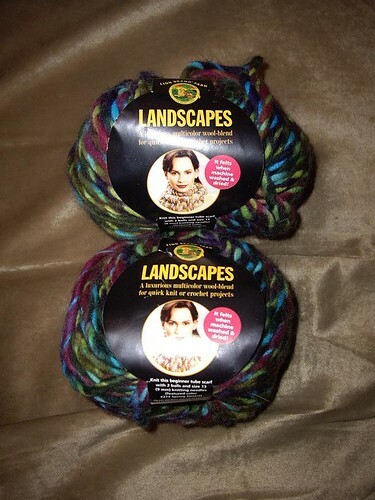 Here is what I scored, 2 balls of Lionbrand Yarn’s Landscapes in Country Sunset. These dark jewel-toned colors are definitely masculine enough for Kevin. The NASCAR Knitting KAL is coming along. I created a worksheet to help determine the points and just need to post it on the blog. With much thanks to them both, Z introduced me to an on-line group for NASCAR, and Robin e-mailed me about the Yahoo! Groups NASCAR Knitters. Neat how stereotypes of knitters and NASCAR fans can be broken, eh? The internet is proof that the world is getting smaller and smaller, and that minds are expanding out of close-minded attitudes. I just hope I finish at least one pair of the socks I have been working on during the race tomorrow! Are you familiar with the Knitta tagging group in Houston? They’ve gotten national press for their habit of taking yarn remants and knitting or crocheting them into pieces that they then tie onto cars and buildings late at night. They regularly tag the footbridge I use to cross busy Memorial Drive when I run. Right now there’s a big heart made of a crocheted tail of red and pink yarn woven through the fence links, with a pompom and Knitta card attached. What a great swap! The shawl kit sounds like a fun project – all ready to go. I was in Boston yesterday, so might have shared that sky and cold weather. 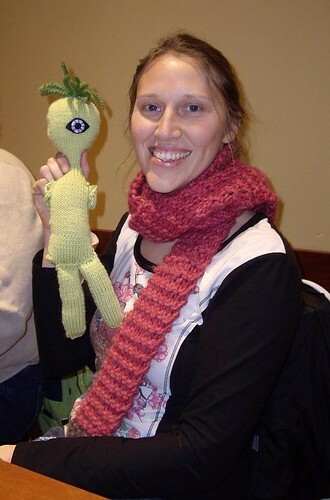 I love the meetup pictures – all those happy knitter on one place. The swap sounds like fun, and the yarn you got will be great for the blanket. 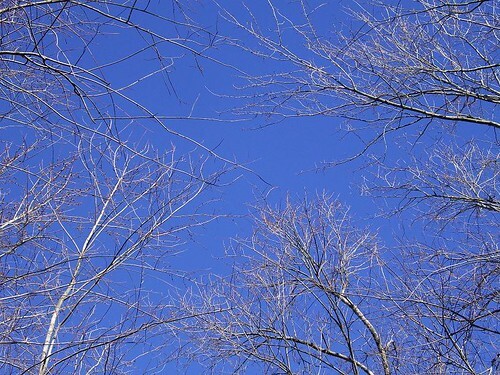 So nice to see a sunny blue sky before the bad weather returns again tonight. Sounds like you had a great time at the knitting meet-up. I love that kind of thing! I had a great time at the meet-up. Thanks again for the lovely angora/wool yarn. I’m thinking mittens. Oh, what a gorgeous sky photo this is! It’s a quite dreary and grey day today here, so seeing this luscious blue cheered me up big time! And yep, it really sounds like you had a great time at the knitting meeting! Looks like you all had a good time! Love the sky shot! Buns! You totally have to try chard. Both red and green rock binkie hard. That will look great for the Blanket of Hope, a good contrast/compliment to other squares I’ve received no doubt.